Claire Steels set a new course record. Bourne Town Harriers had seven athletes home inside the top 20 at the annual Thurlby 10k road race on Sunday. 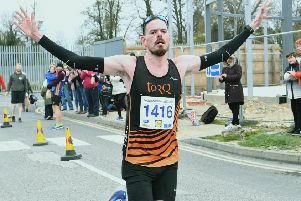 Their first finisher was Jonathan Palmer who came second in 36:56. That was just over a minute behind comfortable race winner Greg Southern from Sleaford Town Runners. Claire Steels was next best in fourth place and the international triathlete, who was first female finisher, clocked a course record 38:25. Stamford Striders also had a good day with Jim Morris finishing third, Chris North seventh, Tim Mahon 14th and Graham Epps 18th.